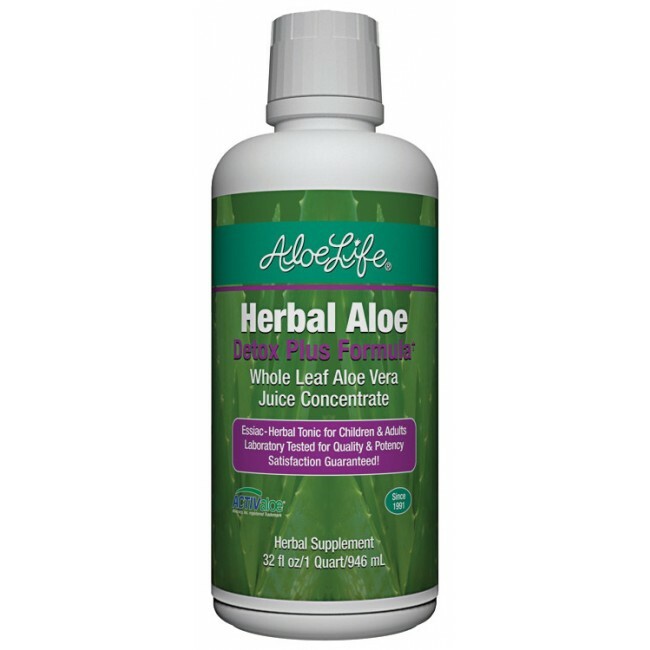 Detox Plus Formula WL Aloe and Herbs is excellent and contains "3 products in 1" - supporting; digestion, detoxification and renewal. More effective than other Detox formulas due to the concentration of the quality WL Aloe, and the 10 Herbal Extracts not diluted with water. The Whole Leaf Aloe Vera Juice may carry the herbal extracts deep into the tissues supporting and stimulating the release of waste residue throughout the lymph system and liver. This formula is very effective containing 4 Essiac herbs plus American Ginseng, Milk Thistle, Astragalus, Cats Claw, and Pau de Arco. Great to detox the body at least once a year if not each season to decrease toxins that we receive from many different factors and or take daily to support overall well being and stamina. Recommended to be taken with Fibermate by Aloe Life to support regularity while cleansing. Delicious lemon, lime plus apple juice (9%), and stevia compliment the herbal formula. Directions: 1OZ 1-3 times daily. For Detox Plan take 1OZ daily gradually building up to 6 OZ for 6 weeks with Fibermate. Drink at least 6 - 8 OZ glasses of water daily and eat an abundance of vegetables and or also include H & S Daily Greens by Aloe Life. May be helpful to take steam baths during the plan to encourage waste removal. Discount on order of 4 or more!